The problems plaguing the food distribution to refugees were raised again at the Refugee Union’s bi-monthly meeting on 20 October 2014. Refugees suffer a grim, insurmountable reality despite the promise of a fair asylum system made by this world-class city. The government takes a firm stance in ensuring that stringent measures make Hong Kong inhospitable to those seeking asylum with the goal of deterring others in their footsteps. It is well-known that refugees are prohibited from working while forced to make ends meet with 1500$ in rent assistance and 1200$ in food rations. But do they even receive this little? The problems relating to the food distribution system are less quantitative (Are 40$ a day enough to eat? ), than structural (Do refugees receive 1200$ a month in groceries?) and administrative (Why do distribution failures persist?). Members of the Refugee Union expressed strong discontent at the in-kind food program that fails to deliver the value, quality and variety claimed by the authorities. It is widely reported that law enforcement agencies are looking into this problem and have yet to either confirm or deny claims as researched and reported by the media, including South China Morning Post and Metro Daily. And yet refugee lament that their monthly food collections are still largely worth less than 1200$ a month. Has the government retreated from its responsibility to monitor and control the refugee food program? Further, complaints were raised about infants who do not receive enough milk formula and some toddlers who are not provided with solid food at eighteen months of age. Mothers’ pleads to case workers are ignored month after month and desperate parents are compelled to beg for assistance when fair assistance is sidestepped without reasonable explanation. Following recent reports that the food program contracts were renewed for nine months (possibly to account for three month’s investigation), it is apparent that the government has no plans to improve the system by providing refugees with cash, or alternatively issuing coupons. Without a new service tender, the current inadequate program will continue till mid-2015. On the face of it, the absence of noticeable improvements seem to suggest that the government is satisfied with the implementation of in-kind food distribution to the refugee community. The Refugee Union exposed malpractices that raised serious concerns, but after the noise died down questions were met with silence and accusations were swept under the thick carpet of government bureaucracy, some might say, indifference. Vision First is concerned that salient answers may be hidden in the contract between the Social Welfare Department and ISS-HK for welfare provisions to the refugee population. Despite repeated request by the media and several lawmakers, this key contract remains a government secret, as if it were a matter of national security, kept from the public eye for reasons that fly offensively in the face of transparency and accountability. In light of the above, digging beneath the issue of food value uncovers problematic issues that, in our view, cannot be resolved without dismantling the entire refugee welfare system to implement programs that are based on wellbeing not deterrence, on legal concerns not immigration policies, on social justice not criminalization, on dignity not immiseration. While injustice is the norm for refugees, the question we should ask is, why do refugees’ complaints so often fall on deaf ears? Who benefits from these arrangements? VF Reports – Is this rendition? On 7 October 2014, on routine reporting to the Immigration office in Mataukok, the claimant was summoned to an interview room where he was warned of imminent removal despite having filed an appeal with the Torture Claim Appeal Board within the allocated time. The claimant stated emphatically that he spoke little English and had trouble understanding what was being said to him. Of significance, neither a Bengali interpreter, nor a duty lawyer were present. It is unclear what was discussed during the interview. The claimant reports that significant pressure was exerted on him to sign a document the significance of which he did not comprehend. 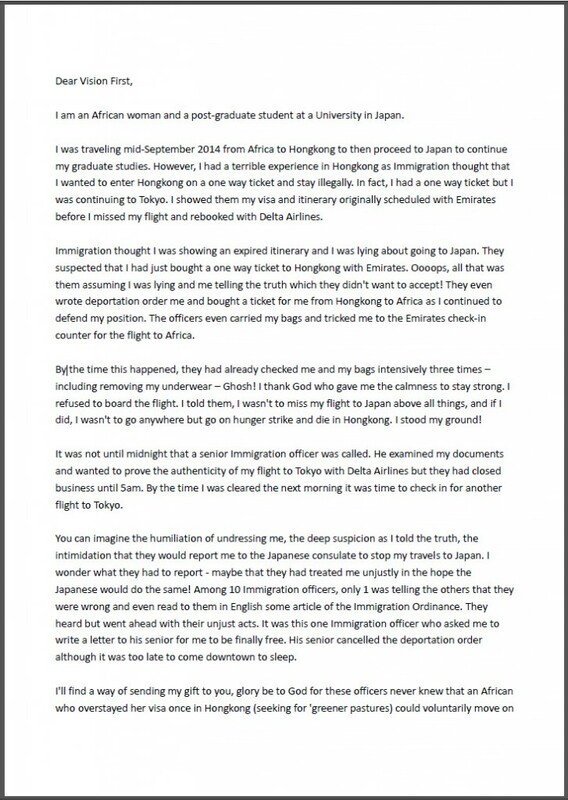 While he had not requested to voluntarily depart Hong Kong, the Immigration officer handwrote a notice that he was made to sign. 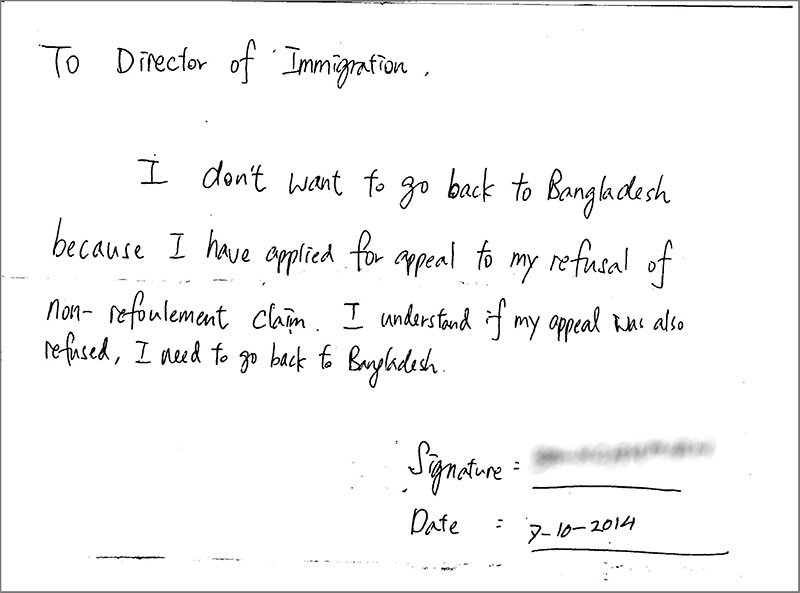 The document stated, “I understand if my appeal was also refused, I need to go back to Bangladesh”. Only after signing the document was the claimant allowed to leave the room. The claimant warned the officer that his life would be in serious danger if he was returned to Bangladesh where political enemies were still searching for him eight years after he fled to Hong Kong. He first politely requested a photocopy of the notice and explained “because I don’t know what is says”. But a shouting match followed in which the officer refused to provide a copy and the claimant refused to leave. Eventually the officer left the interview room and returned five minutes later with a photocopy of the document. On 9 October 2014, the claimant registered at Vision First seeking assistance against what, in our view, amounts to de facto rendition – the practice of handing over individuals from one jurisdiction to another with questionable consideration of the legal process. Facts lead us to believe that the notice was prepared as an acknowledgement and, by implication, a consent by the claimant to be removed to Bangladesh after his appeal will be rejected. While circumstances surrounding this event are unclear, the claimant reports being intimidated by the conduct of the Immigration officer and being fearful of detention pending the outcome of his appeal, whereby he would have been denied an opportunity to apply for a judicial review at the High Court. Vision First never before sighted such a handwritten notice which is inconsistent with domestic and international legal principles. It purports to represent an unconstrained declaration by a refugee who seems unwilling to pursue further legal remedies after the likely rejection of his appeal case, but actually its production is both sinister and disturbing. The notice is manifestly neither a legal document, nor a standard Immigration form. Vision First emailed its concerns to the Immigration Department and will monitor the liberty of this claimant. Refugees are strongly urged not to sign documents from government departments, Immigration in particular, which they do not fully understand and for which legal advice and professional interpretation was not provided. If in any doubt, the correct procedure is to take the documents away to seek independent legal advice before signing them. Don’t most asylum seeker come here to work? Vision First is often asked by government officials, journalist and members of the public we interact with: “Don’t most asylum seekers come here to work?” A cogent answer cannot be provided without acknowledging that economic motives generally overlap the asylum goals of those who migrate or flee to a developed country. The need to work does not establishes a black and white distinction between genuine and bogus refugees (terminology we reject), but rather it diffuses a thousand shades of gray over a vortex of interconnected modern lives. Deep relationships with the refugee community, place Vision First before a broad picture of the asylum sphere which reveals that economic worries are on the whole as pressing as protection concerns across the ranks of all refugees, from newly arrived claimants, to those voluntarily departing, from accepted torture claimants to mandated UNHCR refugees awaiting resettlement. It seems that, like gravity, nobody can escape the unrelenting pull of economic forces. “But why do genuine refugees need to work?” is often the follow-up question by those who are not persuaded by the first answer. Refugees negotiate the harsh reality of living in a city in which policies are formulated to immiserate their livelihood. The welfare system barely meets half of refugees’ basic needs. In consequence, a small minority may rely upon handouts from a few churches and charities as a coping mechanism, but their number is necessarily very limited and resource-draining. By contrast, a large majority works to complement inadequate welfare and to preserve self-dignity and respect. Further, even recognized torture claimants and refugees strive resolutely to honour duties towards faraway families and other obligations that international protection did not extinguish. It should be appreciated that few refugees are completely uprooted from the communities they once called home: they may have left spouses and children behind; they may need to support aging parents or sick relatives; they may endeavour to protect loved ones still in harm’s way. Imagine for a moment being suddenly forced overseas without your family – never to return. Seeking asylum abroad does not sever overnight relationships and commitments established over decades, but only makes them harder and more distressing to manage. Besides, nobody moves to a developed country without being strained by constant financial requests from people left behind. Another question is then, “I saw refugees selling their food. If they do so, it means they have enough assistance, right?” This is hardly so. Unfortunately money is still the issue. There are refugees who sell their food to pay for transportation, buy clothes or purchase culturally more appropriated foodstuff. The current in-kind welfare assistance does not provide credit for phone and even a 20$ reload card is expensive for those living off handouts. Irrespective of the merits of individual cases (which are solely for Immigration to assess), in this day and age, it is simplistic to presume to remove economic motives from asylum, as if refugees were not deeply rooted in the money-driven reality that globalization has spread from pole to pole in the last sixty years. 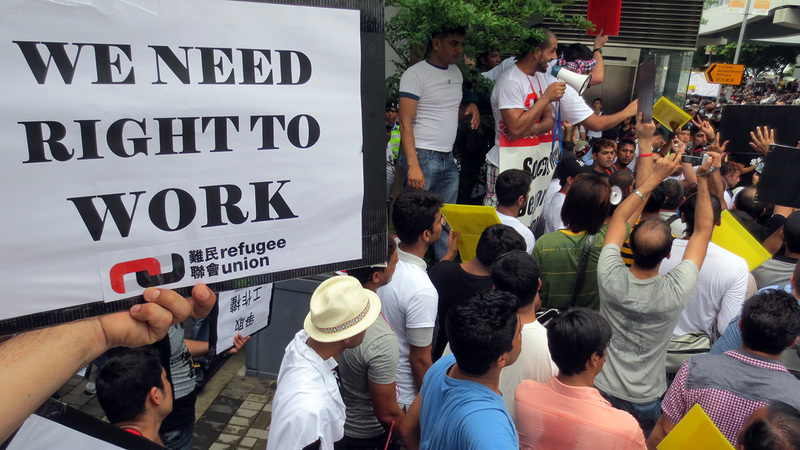 All refugees need to work, or somehow produce regular income, because they are not immune to structural economic demands in Hong Kong and possibly also back home. The black and white distinction based on work is a myth circulated to separate ‘genuine’ refugees from ‘bogus’ ones. It is designed to raise suspicion against those who are perceived to be less desirable, with a view to discredit them. Contrary to popular belief, refugees are connected people and have to work like everyone else: some refugees may struggle under conditions of exploitation, a few may be more successful, but most of them are buffeted by economic forces nobody escapes. Vision First launches a series of blogs, under the title “VF Reports”, to make public challenges refugees report to us that we believe are of great public concern. One by one these might be considered minor cases, often personal in nature, although the troubles suffered by one person are often indicative of a wider malaise that should be thrust into the spotlight, because the predicaments of refugees endanger public safety. On the one hand, this hardship is arguably not restricted to the refugee community, but speaks of a broader ‘humanitarian deficit’ in Hong Kong. On the other, it is the result of public attitudes and policies towards the underprivileged that may ultimately result in higher crime rates and illegality that cause undesirable, and preventable, domino effect in society. 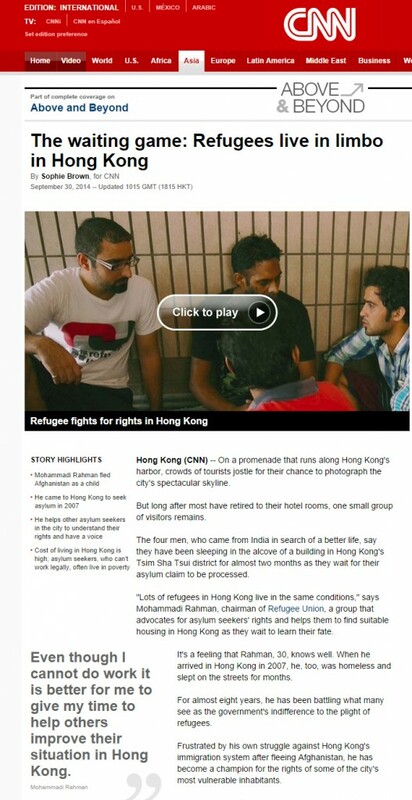 In this respect, the “VF Reports” will draw from stories narrated by refugees and correspondence with relevant government department and agencies whose assistance Vision First seeks to remedy situations that, in our view, fail to deliver legitimate services, violate refugee rights and ultimately pose a threat to public safety as well as law and order. 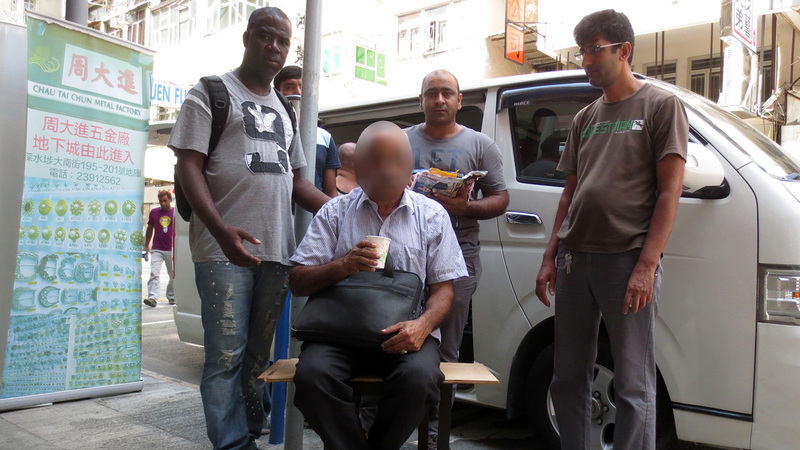 Vision First reports the case of two South Asian refugees, one suffering from an incurable and transmittable disease, who informed that they recently signed a contract for a small flat in Sham Shui Po. Fearing to become homeless when previous contracts expired, these two friends took the initiative to locate a modest flat offered for 3300$ a month. They knew that the singleton rent allowance should be up to 1500$, so they agreed to share a room. Their commendable efforts however turned into a nightmare. Familiar with local realty customs and aware that bargain flats do not remain long on the market, Vision First was told by these two middle-aged men that they persuaded a resident friend to lend them 9,250$ to close the deal. This included 3,300$ for the security deposit, 3,300$ for the first month rent, 1,650$ in agency fees and 1,000$ for the water and electricity deposits. Satisfied with their new home, the two refugees took the paperwork to their case workers at the NGO contracted by the government to provide refugees with services. To their great disappointment, their case workers apparently said they cannot refund the security deposit, first month rent and agency fee. It is unclear why this occurred, but the two refugees reported that the refusal caused them great distress, as they had promised the kind lender to refund 9,250$ they had urgently required to secure the bargain flat they would call home. The refugees reported that they anxiously explained to their case workers that if they hadn’t borrowed money to secure that room, the landlord would not have waited for them or for their case workers to visit and confirm the unit in the future. Time, for them, was indeed of the essence. The two men also reported that in an attempt to find an alternative solution, their case workers apparently suggested that they give up that flat so that the case workers could pay cash for another unit. This however would imply the forfeit the money already borrowed and paid to the first unit. They pointed out that refugees are prohibited from working and had relied on a refund to repay a loan made to them in good faith, as such expenses should be paid according to these SWD instructions. It appears that unnecessary hardship was inflicted upon these two refugees. In saying this, we do not imply that anyone concerned was at fault. It may well be that the refugees did not understand often rigidly drafted policies. However, it is obvious that these refugees are now hard pressed to seek remedies to their predicament that might raise their visibility with authorities. These two friends might have to work to earn 9,250$ to repay the loan that secured their home. If public policy is aimed at upholding law and order, shouldn’t these two refugees be exceptionally permitted to raise emergency funds to solving this financial crisis? But work is prohibited for refugees, so do they need to turn into criminals to secure adequate housing? Wouldn’t a sentencing magistrate be keenly interested in the denial of service that caused this predicament in the first place? In other words, a refugee must first become an overstayer – somebody whose visa expired – before he or she can apply for asylum in Hong Kong. Prior to that day some refugees entered regularly through a border crossing, either when in possession of a valid visa, or when granted visa-free access. After lodging USM protection claims with Immigration Department and being released on their own recognizance, refugees become eligible for welfare assistance from the Social Welfare Department. In the meantime, most newly arrived refugees experience the problem of securing room and board in our expensive city, while they wait weeks, if not months, for Recognizance Forms. Vision First previously raised concerns about the absence of a comprehensive intake strategy for asylum seekers, which leaves newly registered claimants in an appalling state of destitution, without food and lodging. Few observers would disagree that the Hong Kong Government has a duty to prevent unnecessary suffering within this vulnerable group without a local support system. However, this humanitarian crisis starts earlier, when prospective refugees are restricted from seeking asylum by the Immigration Department, because they still hold valid visas and are not yet subject to removal. In this respect, visitors are generally granted visas (or visa-free entry depending on country of origin) ranging between 14 and 90 days, which for many refugees turns into a period of agonizing hardship. Vision First queries if it is not preferable for the Immigration Department to accept asylum applications irrespective of visa terms from individuals who manifestly require immediate protection. Such persons might have strong evidence supporting the urgent filing of claims and Immigration should have the flexibility to expedite the acceptance of their claims. Since Immigration has the power to revoke visas and remove visitors who are no longer welcome, then surely Immigration should also have discretionary powers to protect asylum seekers who demonstrate an urgent need for protection and assistance. In our view, it is arbitrary that highly vulnerable prospective claimants should suffer the entire duration of an unnecessary tourist visa issued by the very department that should protect them. Vision First argues that current restrictions on claiming asylum not only cause needless hardship to desperate refugees, but make them act illegally, thus reinforcing stereotypes that all refugees are overstayers and illegal migrants who should be treated harshly for challenging law and order. Such restrictive policies also put public safety at risk, as hungry refugees-to-be might commit crimes they would not ordinarily commit if adequate protection and welfare were available. Looking at this situation broadly, Vision First suggests that, where sufficient justification is found, Immigration could process urgent asylum claims while tourist visas are extent, or suspended for the purpose of facilitating applications. Is it reasonable that visas issued by Immigration prevent the same department from accepting urgent claims without a mechanism to overcome this? Is this the case of the visa section preventing the asylum section (RAS) from carrying out its duties? It seems there is space to improve the rationale of this internal arrangement before the relevant laws are amended in future. 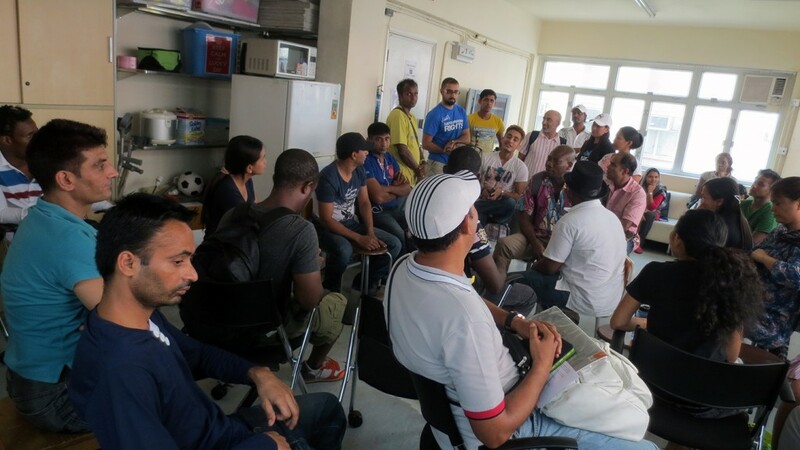 Following eight turbulent months of street activism the first organization to unite asylum seekers and refugees in Hong Kong regroups for the next phase of development. 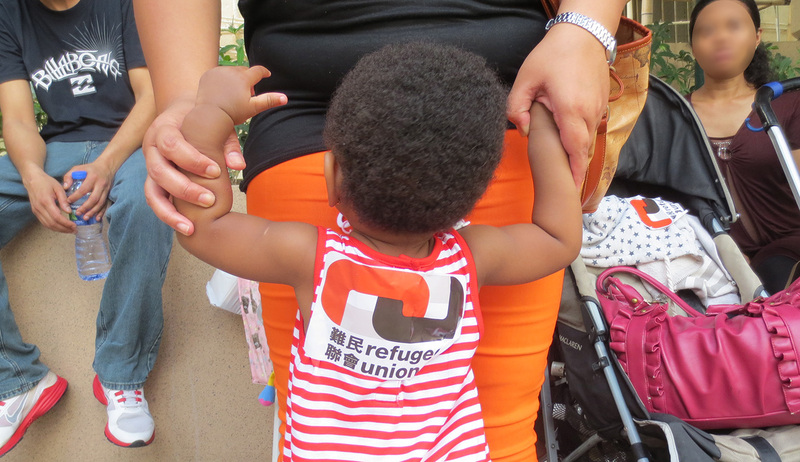 Born from a widespread dissatisfaction with failed welfare services, the Refugee Union is steadily evolving into a society that promotes the human and refugee rights of its members. By-monthly meetings continued regularly since the Union was conceptualized on 27 January 2014, which in itself is a testament to its leadership’s organizational skills, their wish to participate (particularly considering that members are not provided with transport fees), often accompanied by children and friends who wish to join this promising society. Forty-five old and new members signed the attendance record at Monday’s gathering. These meetings are foremost an opportunity for members to evaluate current strengths, weaknesses, opportunities and threats (SWOT analysis) and refine objectives in a harsh environment in which threats are numerous and opportunities almost non-existent. Such is life for refugees whose resilience, tenacity and self-reliance is challenged to the highest degree in our unwelcoming city. Most claimants are cognizant of the fact that significant progress requires personal commitment and self-sacrifice. Many hands shot up when questions were asked about new problems. 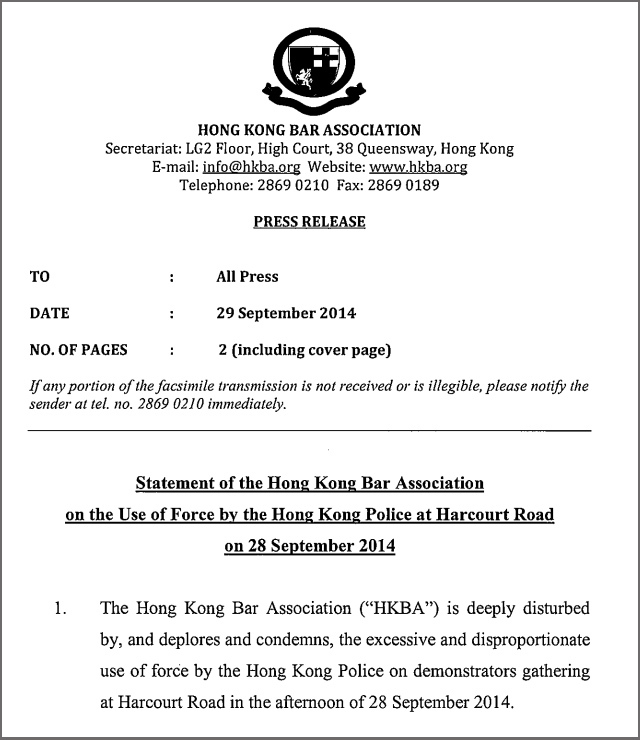 For example, it appears there is great uncertainty about the food supplied by the ISS-HK appointed grocery shops. Refugees reported hearing from staff at the shops that supply contracts ended in September and the itemized client lists for October had not been distributed. This situation is highly unusual as the shops will not stock the necessary supplies for next week after their contractual obligations have ended. While the following information cannot be verified, ISS-HK staff informed some refugees that they had not submitted the food lists to the shops because the SWD had not renewed the contract yet. It may be surmised that if the shop contracts ended, there should be calls for tenders on the ISS-HK website (the usual practice since 2009), but there are no such documents. Further, shop owners complained they would not continue supplying at the old tender prices because groceries appreciated significantly in the past year. 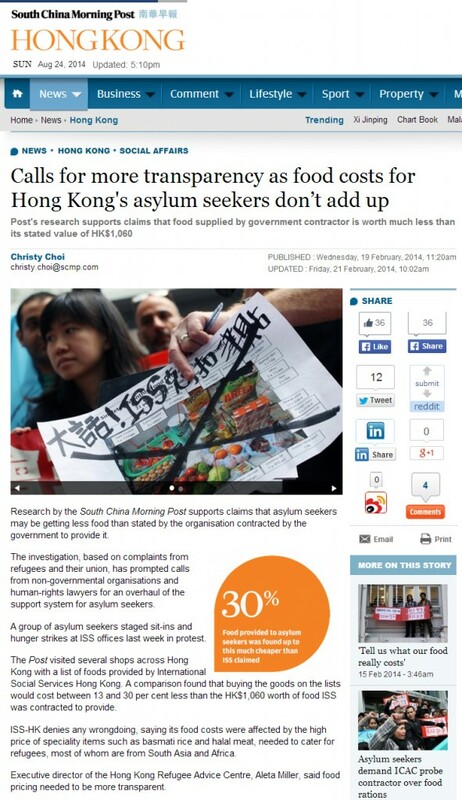 Other problems refugees face related to rent and deposit payments approved discriminately by ISS-HK case workers. The Refugee Union lodge complaints with the SWD against case workers denying the full 1500$ rent assistance (to refugees who pay that much or more), or refusing to pay security deposits with no better excuses than flat rejections. In this respect, several participants reported that less confrontational refugees seem are less likely to receive full assistance than those who stand up for their rights. Further, looming ahead are issues relating to the blanket rejection of USM cases by the Immigration Department and its Appeal Board. As far as the community knows, the acceptance rate hasn’t improved since the Unified Screening Mechanism (USM) was launched last March. On the plus side, this year refugees appreciated that appeals must be lodged even if the process is believed to be hopeless. The trend is such that the last reasonable chance is to apply for a judicial review at the High Court (Form 86) with assistance from Legal Aid. In the long run, this might have serious implications for the higher courts that could soon be overwhelmed by hundreds, if not thousands of plaintiffs demanding justice where protection was unreasonably denied. 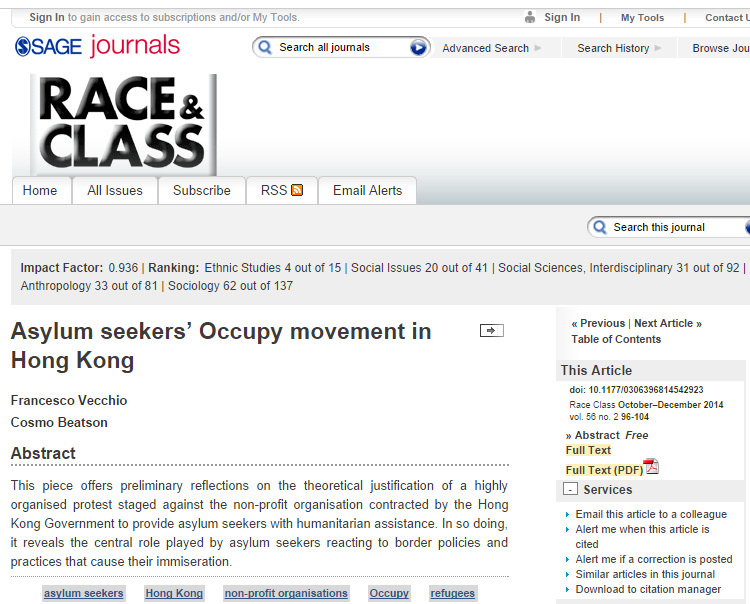 Due to poor implementation, the Hong Kong asylum arena remains chaotic.